While Times Square rang in the new year, we restored “The Village” by artist Joe Doucet. 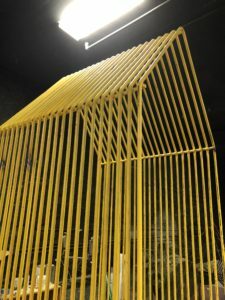 These sculptures can see over 10,000 visitors a day. They needed a sturdy and longer-lasting face lift. 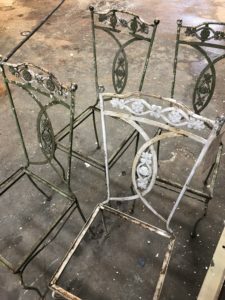 Outdoor metal artwork and furniture need to be refinished. Salt in the winter and sun in the summer wear away at finishes. Rust can grow and make them vulnerable. Pieces in high traffic areas, like Times Square, experience more wear and tear. 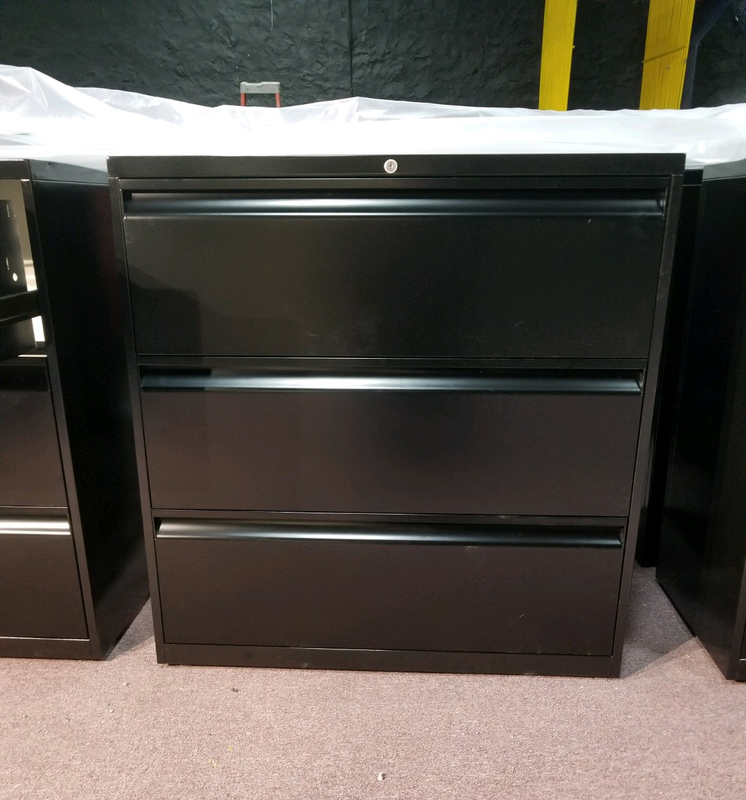 With this new powder coat finish, they are good to go for several more years. We sandblasted them clean, removing the previous paint and rust. Then we treated the bare metal with an iron phosphate anti-corrosion spray. 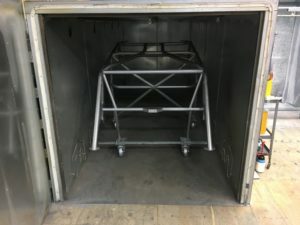 The size of the cages made for a tight fit. Our oven’s dimensions just managed to fit the cage with a few feet to spare. Next time you’re in Times Square, stop by and take a selfie with these awesome sculptures! 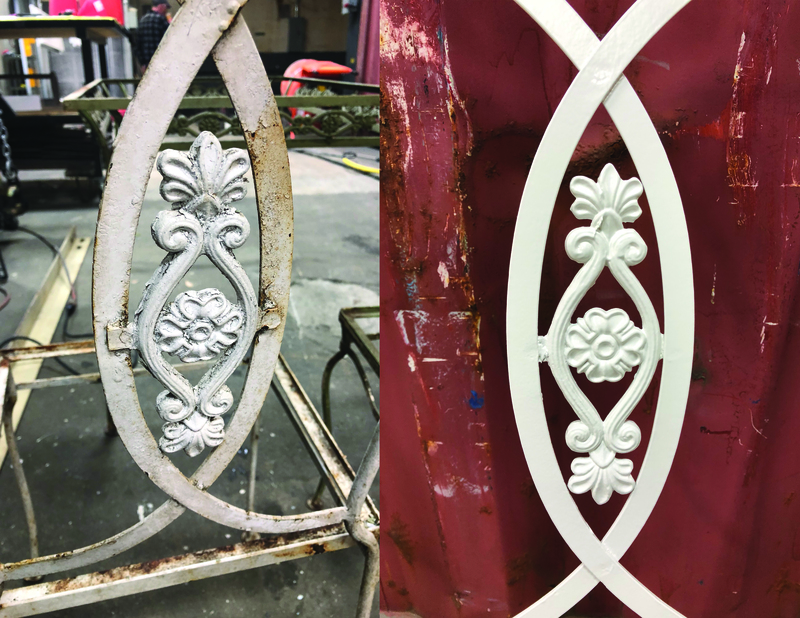 Contact us with your restoration and metal finishing projects! 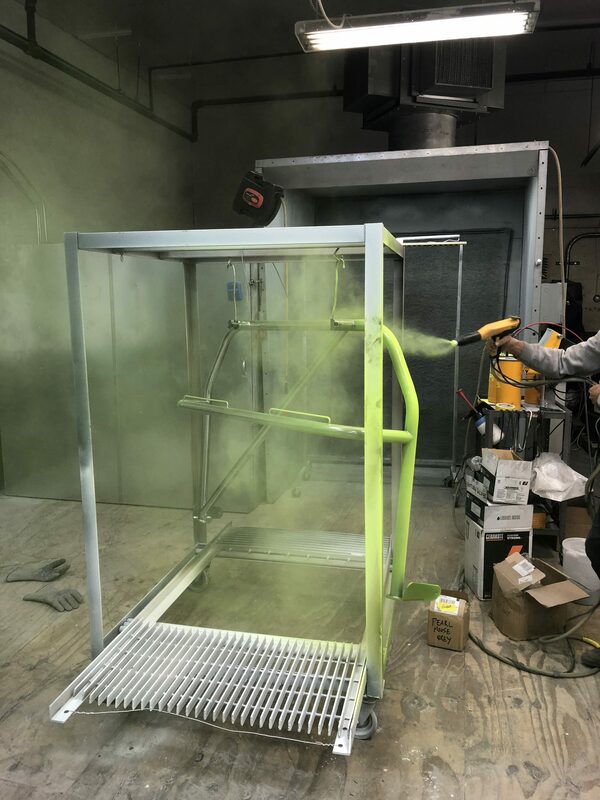 After the primer coat, we powder coated the cages bright yellow and blue again. We sprayed them on their side. 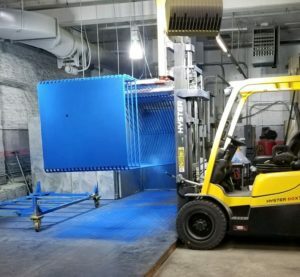 Then we lifted them on the forklift to get every angle covered. More photos of the whole process! This vintage table was an unusual project. 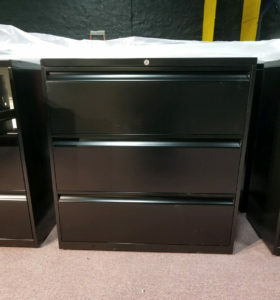 Most of the time, we fix old scratches and discoloration to refurbish furniture. This project was an attempt to preserve those imperfections. The old layer of paint was flaking off, which is not something you want with a kitchen table. We sandblasted that layer away so our client could see the bare metal. They loved the industrial beat-up look of the surface. They decided they wanted a clear coat that protects the table while preserving the vintage look. The matte clear top coat brought out some interesting details. 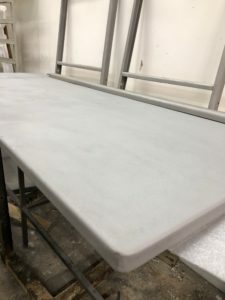 The finish also makes sure the table is protected for daily use in a family home. Contact us to find out about how we can help you with your vintage furniture! Custom color matching is an involved and pricey process of trial and error. We recommend exhausting all possible existing color samples from our different suppliers before deciding to try color matching. 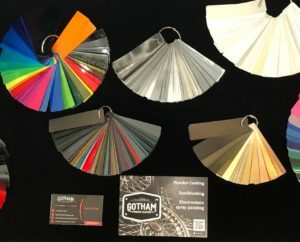 To find out more about our custom color mixing policy, contact us for more details. Before asking for a custom color, we would recommend trying to just find a match from existing samples. 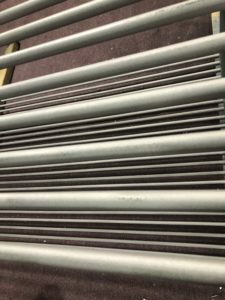 An RAL color chart is the first place to look, because this is the universal color code for powder coating. 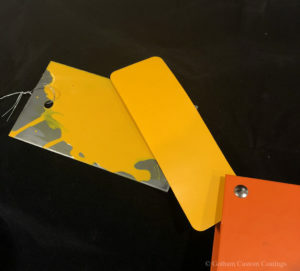 one client wanted a powder coat that would match a touch up paint they already had – we painted a panel with the paint and after it dried we matched it up against all the yellow swatches we had in stock and sure enough we found one that was so close you wouldn’t be able to tell they weren’t the exact same color. It’s hit or miss to pick a color off a screen, so we always try to make sure you pick your final color based on a physical sample. We have swatches from our suppliers, or we can make a sample here in the warehouse. Sometimes it’s not so easy, and we end up having to order all sorts of sampled to find the right match. One customer needed a very particular shade of pink. 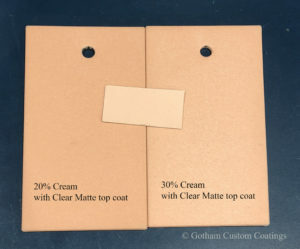 When none of our suppliers had a color that matched, we worked our way to the right shade by mixing the two closest colors through trial and error. The challenge, though, is that powders aren’t like paint. 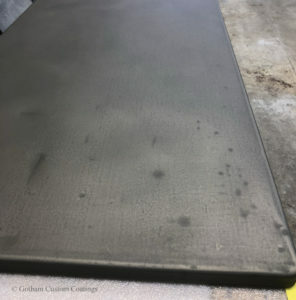 The colors don’t fully blend, and if you look at the finish very closely, you’ll see the different little spots of the two colors, like little speckles and grains in the finish. In these custom colors, you can see that we used a pinkish red and a light cream – you can see the white speckles standing out against the red. 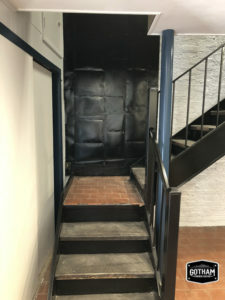 Every project is a little different, and we try our best to meet your individual needs. Contact us to see what we can do for you! We finished up some beautiful brass colored grills this week. Take a look at the smooth metallic finish! The cold weather is keeping us all indoors, so it’s the perfect time to get ready for the spring! This particular dining set our clients actually want to use them for indoor use. They liked the brass decorative knobs so much, they asked us to keep them free of powder. We polished them up to a mirror-like shine, then wrapped with a heat resistant tape. This way, no powder landed on the brass, and after the chairs came out of the oven we simply had to peel the tape away! 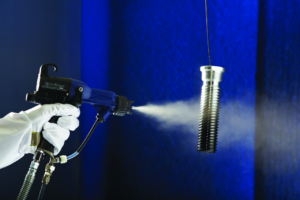 We can coat anything with powder rated for exterior use. As long as you follow the suggestions in our care sheet, then your furniture should last you for many more years! Contact us to find out how we can help you restore your outdoor furniture! 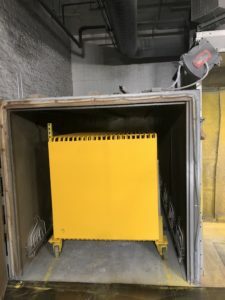 We recently finished up an exciting project. 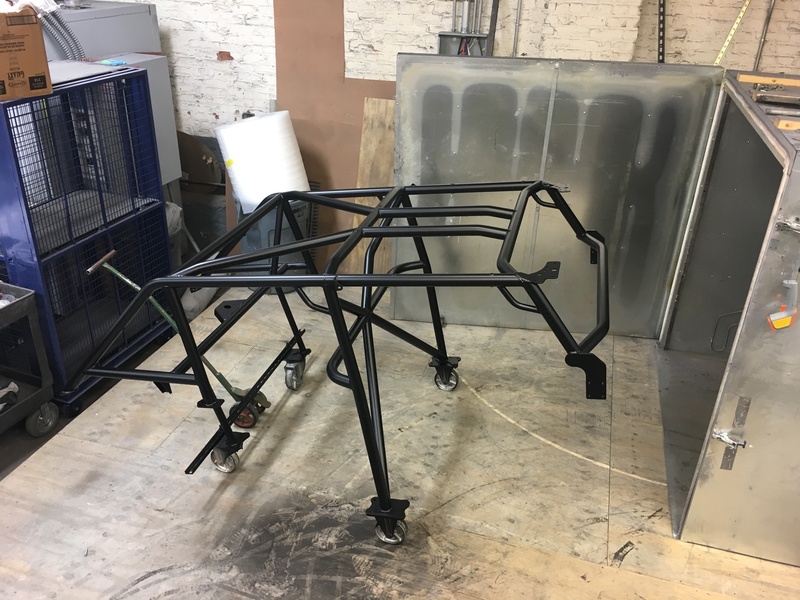 A customer brought in a newly fabricated Jeep roll cage to be finished. First, we blasted all the welding residue off the piece, bringing it down to its base metal. 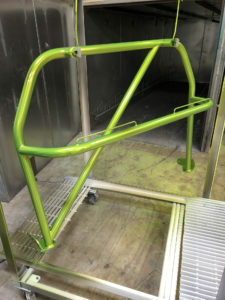 Figuring out how to work with such a bulky piece through each step of the powder coating process was tricky. Instead of hanging it like usual, our technician actually bolted metal wheels onto the base of the frame. 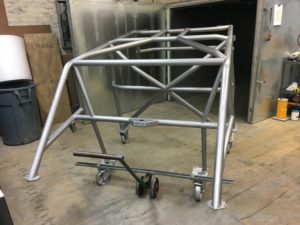 After that, we could easily move the roll cage around the workshop. The customer chose a lovely satin black that really makes the piece look road ready. We thought this project was a fun challenge, and you can’t beat the results! 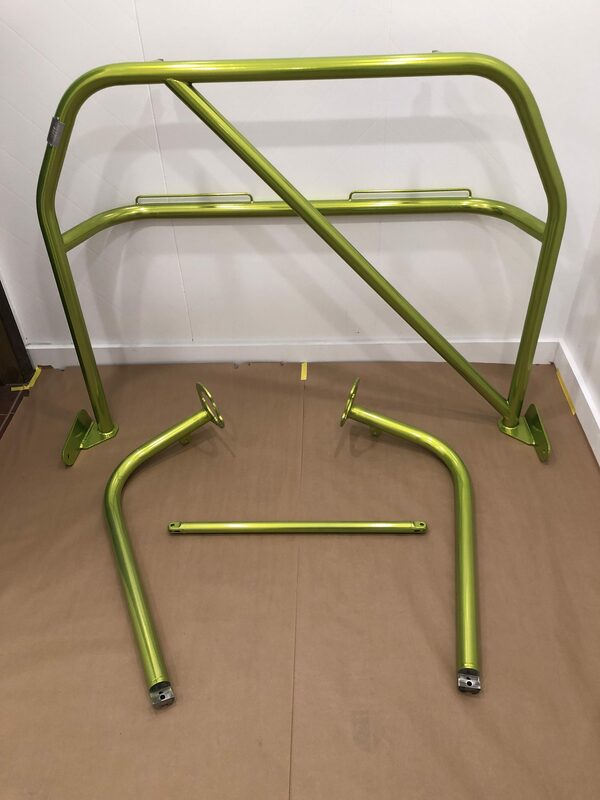 We think roll cage will look great once it’s installed. Contact us to find out how we can help you with all projects, great and small!